During the pre-ordering period prior to publishing in May, you can order either or both books here, with the added bonus that each book will be signed with a personal note for you. 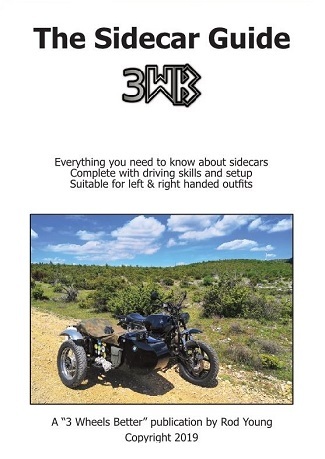 The Sidecar Guide contains everything for the sidecar rider, new or experienced, with sections on riding skills, sidecar setup, issues and solutions for handling problems, sidecar selection, accessories, care and maintenance, and much more. See what's inside the book! 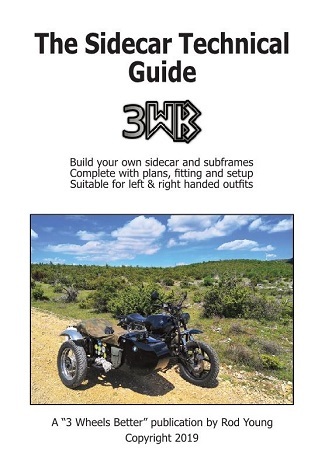 The Sidecar Technical Guide is for the sidecar builder, it contains the sidecar setup section as well, but also full technical details on how to design and build your own sidecar along with subframe design and construction with plans and diagrams. Everything about sidecar construction you need to build or modify your own outfit. The sidecar building book. Purchase either book for £20 during pre-ordering, or both for the special price of £32. £2 for each book or £4 for both will be added at checkout for worldwide postage for your books. Together these books are the first new sidecar books to be published in many years and draw on my many years of experience operating 3WB Sidecars as well as the invaluable contributions made by specialists in the fields of disabled sidecar use and taking your dog in the sidecar. I hope that they will become the "go to" reference for sidecar riders and builders. Both books are written for left and right handed sidecars. You do NOT need a Paypal account to order. You can use a debit or credit card. Each link will take you to a secure page for payment. Thank you so much for your interest in these books. Without all the support and advice from 3WB fans, it would not have been possible. Please note that this is pre-ordering. Your book will not be dispatched until publishing commences in May. You may not receive your book until early June at the latest. But you will be among the very first to receive your copy. The Sidecar Guide (Book I) What's inside? Pushing / basic handling etc. Braked sidecar / unbraked differences and tech. What not to do, bad setup, poor fittings etc. Setup /driving issues with troubleshooting table. The Sidecar Technical Guide (Book II) What's inside? Some of the headings below are the same as in Book I, but they are discussed in much greater depth with technical details. Welcome to Three Wheels Better, this book aims to provide accurate and useful information for everyone with an interest in sidecars. Whether you are looking at getting your very first sidecar, building your own sidecar, working on your existing sidecar, or just wanting to learn more about them and how to ride better, there is something here for you. This is Book I; Book II is all about sidecar construction, it contains a wealth of more technical information for those of you that wish to build your own sidecar outfit or adapt and change an existing one. The information in this book covers everything for people new to sidecars plus lots more for existing owners that wish to gain a greater understanding, including the technical aspects of setup. Three Wheels Better, previously known as Motopodd, was the name of my sidecar company in the UK which I founded and ran for 10 years. Since then, I have emigrated to Croatia, where the roads are sidecar heaven. I remain passionate about these idiosyncratic forms of transport. I have built an outfit here for my own use and continue to offer advice and assistance to sidecar riders everywhere. Whilst there are many online resources for sidecar people on the internet, I felt that it would be useful to put all of my experience and the experience of others down in a book, which could become the go to reference for anyone with an interest in sidecars. I have been riding bikes since I was 16 years old, and over the past 35 years I been a part of every motorcycle experience that is available, from road riding, long distance touring, off roading, racing, rallies, winter rallies, bike maintenance, building bikes, working in the bike industry in various roles and finally running my own sidecar company producing my own sidecars and outfits, developing fitting systems for difficult modern bikes and working towards the perfect setup. I am a qualified production and mechanical engineer. I have been writing articles for the motorcycle press for many years. I live on the Dalmatian coast in Croatia with my wonderful partner Cheryl and far too many cats.